HMAC algorithm stands for Hashed or Hash based Message Authentication Code. It is a result of work done on developing a MAC derived from cryptographic hash functions. HMAC is a great resistant towards cryptanalysis attacks as it uses the Hashing concept twice. HMAC consists of twin benefits of Hashing and MAC, and thus is more secure than any other authentication codes. RFC 2104 has issued HMAC, and HMAC has been made compulsory to implement in IP security. The FIPS 198 NIST standard has also issued HMAC. As the Hash Function, HMAC is also aimed to be one way, i.e, easy to generate output from input but complex the other way round. It aims at being less effected by collisions than the hash functions. HMAC reuses the algorithms like MD5 and SHA-1 and checks to replace the embedded hash functions with more secure hash functions, in case found. HMAC tries to handle the Keys in more simple manner. The working of HMAC starts with taking a message M containing blocks of length b bits. 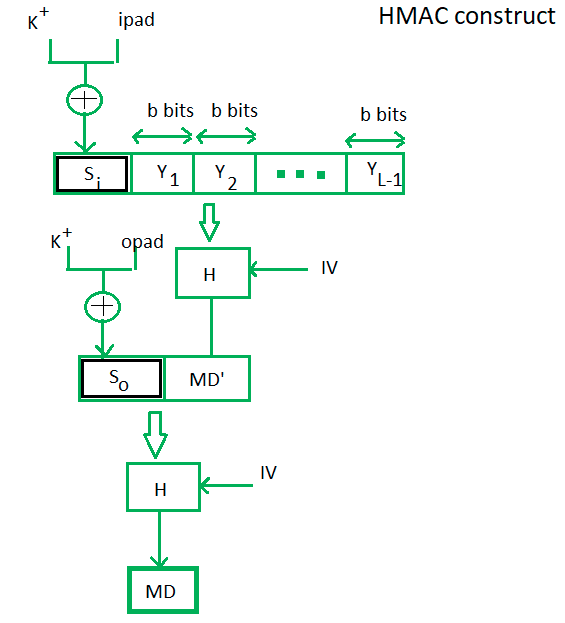 An input signature is padded to the left of the message and the whole is given as input to a hash function which gives us a temporary message digest MD’. MD’ again is appended to an output signature and the whole is applied a hash function again, the result is our final message digest MD. The generation of input signature and output signature Si and So respectively. To a normal hash function HMAC adds a compression instance to the processing. This structural implementation holds efficiency for shorter MAC values.